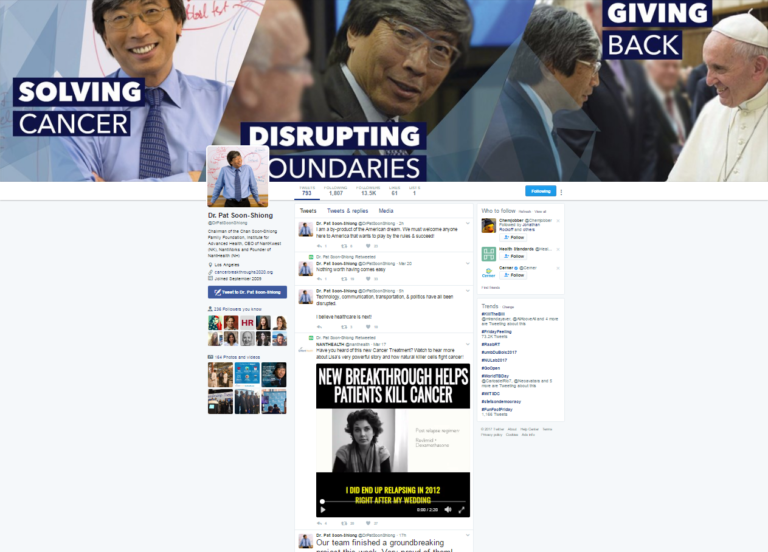 Billionaire Dr. Patrick Soon-Shiong retweeted the video several times in recent days, amid a flurry of social media posts in which he vowed to “solve” cancer. But where the ordinary viewer might see an inspirational story, drug industry experts saw a likely violation of federal regulations. That’s because Soon-Shiong is the CEO of the company, NantKwest, that’s working on the therapy in question, which still has to go through much testing to see if it works. And federal regulations bar the promotion of drugs that have yet to be approved by the Food and Drug Administration. After STAT asked Soon-Shiong’s public relations director about this issue last Friday, the video was taken down from Twitter and Facebook, where it had been posted by another of Soon-Shiong’s companies, NantHealth. Over the weekend, it was replaced with an edited version that cut out two of the most powerful — and, experts said, most troubling — lines in the script: The patient’s emphatic declaration that she believes she has been cured by the experimental therapy, and her musing that her doctors also believe it’s working. That edit also removed the NantHealth logo, which had been superimposed on nearly every frame. And it cut out specific references to NantKwest’s therapy, which is known as NK-92. 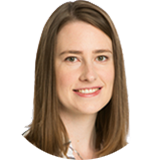 Soon-Shiong’s spokeswoman, Jen Hodson, said the video was not intended to be promotional; she called it an educational tool for patients. She said it was edited to remove lines that might have been confusing because Soon-Shiong’s company did not sponsor the clinical trial that the patient participated in. The trial did, however, test a NantKwest drug. The video posts come as Soon-Shiong and NantHealth have mounted a PR offensive to challenge two investigative reports published by STAT in recent weeks. In the first, STAT found that Soon-Shiong’s much-touted cancer moonshot initiative, which aims to develop a cure for cancer by 2020, has made little scientific progress and instead has functioned mostly as a marketing vehicle for one of his new products, a cancer diagnostic tool. The second story described how Soon-Shiong made a $12 million donation to the University of Utah for research — but reaped significant commercial benefits from that gift, as the contract was written in a way that led the university to conclude it had no choice but to send $10 million back to NantHealth to pay for genetic sequencing. 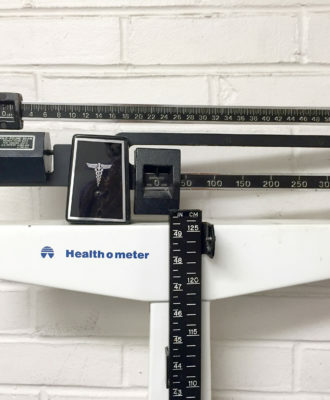 NantHealth’s stock has sunk more than 33 percent, to $4.75 a share, since the publication of STAT’s second report three weeks ago. NantKwest’s stock is down to $3.39 a share; it’s been falling steadily since the company first went public in the summer of 2015. 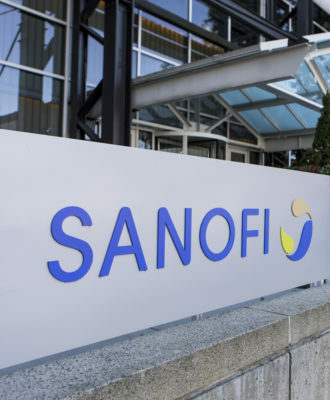 In the wake of the STAT reports, at least three investors have also filed suit against Soon-Shiong and NantHealth, alleging violations of federal securities law. Soon-Shiong, who has a reputation in the industry as a brash showman, has used skillfully produced videos in the past to promote patient success stories and convey his unshakable optimism that he is on track to vanquish cancer. But the several-minute-long video about natural killer cells appears to have crossed a line. The FDA prohibits any sponsor moving a drug through clinical trials, or anyone acting as an agent of the sponsor, from making promotional claims about a drug’s safety or efficacy before it’s been approved. The video was originally posted by Soon-Shiong’s diagnostics company, NantHealth. That in itself may not have been a violation of FDA rules, because NantHealth is not the sponsor developing the natural killer cell therapy; the company doesn’t develop drugs at all. Soon-Shiong, however, is most definitely involved in the development of the drug, since he runs the company working on it. So as soon as he retweeted the video, he likely ran afoul of the FDA rule, experts said. Soon-Shiong’s retweet of the video was “totally inappropriate” and “a conflict of interest,” said Dr. Michael Wilkes, an internist at the University of California, Davis, who has studied drug promotion. “It certainly is not in the spirit of what we expect in saying that you can’t promote until it gets FDA approval … to have your left hand promote it when your right hand [is developing] it,” Wilkes said. 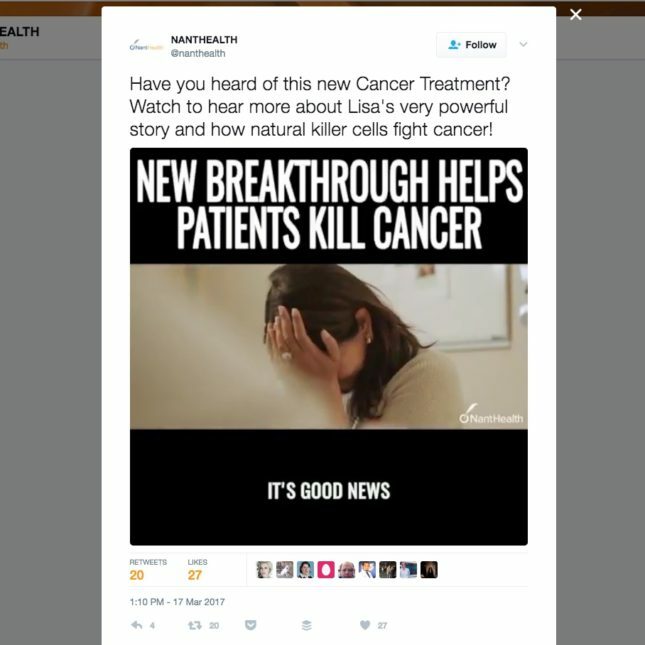 Cooke said it was possible that NantHealth’s original posting of the video also violated FDA rules, depending on its relationship to the natural killer cell therapy being touted as a breakthrough. NantHealth is slated to provide genomic analysis for NantKwest’s clinical trials, Hodson said, but the precise nature of the relationship between the two companies is unclear. Indeed, early results of therapies using natural killer cells — which are engineered to recognize and attack cancer cells while sparing healthy ones — have been far less encouraging than the bold promotional language would suggest. Diagnosed with the blood cancer known as multiple myeloma, Ray tried chemotherapy and a stem cell transplant — but relapsed in 2012, right after getting married. Then she joined a clinical trial in Toronto to try a natural killer cell therapy called NK-92. In the video, Ray goes in for a routine blood test with her doctor, who tells her that the development of natural killer cells is “going to revolutionize” cancer treatment. Speaking with great emotion, Ray repeatedly says that her optimism has been vindicated. “This clinical trial that I did, I feel that I have been cured after that,” she says at one point in the original video. The original video closes by saying that Ray’s blood work confirms that she continues to be in complete remission. That has been removed from the edited version. Ray confirmed to STAT that the clinical trial she had participated in was a small, early-stage study of NantKwest’s natural killer drug in 12 patients. During that trial, she continued on a regimen of approved chemotherapy and a steroid, which she’s still taking today, she told STAT. It is possible that it was the chemotherapy that put her cancer into remission, rather than the NK-92; the study was designed to test the safety of NK-92, not to measure its effectiveness. Researchers announced the result of the NK-92 study at a conference in late 2015, and it was not a blockbuster. They did conclude the therapy was safe, because just one patient out of the 12 reported fever and chills related to the infusion of the drug. But the efficacy data fell short of what you might expect from a “breakthrough.” While four of the patients saw some sort of response, it was short-lived in three of them. And 10 of the 12 patients dropped out of the trial because their disease had progressed. Asked about the claim that the experimental therapy is a “breakthrough,” Wilkes didn’t mince words. “The data is blatantly not supporting that statement, and the video blatantly uses emotion, not science, to make the case that this drug deserves a try,” he said. Indeed, the entire field of natural killer cells is in its infancy. NantKwest has advanced to Phase 2 trials with one combination of natural killer cells used to treat patients with the rare cancer called Merkel cell carcinoma; the company last year presented results from three patients. The FDA recently granted the therapy “orphan drug designation,” which confers certain benefits, such as tax credits for clinical trials, but NantKwest still has to test the drug in more patients before submitting it for approval. Other companies, such as Florida startup Cyto-Sen Therapeutics, are trying natural killer cells, too, but the studies are early-stage. Cooke said he had “a very strong visceral reaction” to hearing NantHealth promote that remark. “There’s a reason that [physicians are] not willing to say that, and that’s probably because there’s no evidence for saying it,” he said. Asked whether she’s concerned the video could be giving false hope to patients, Ray told STAT she saw the video as a chance to bring immunotherapy into “the public discourse” and present her own experience. “I firmly believe this video is about sharing my own personal journey,” she said. In recent days, Soon-Shiong and NantHealth have also circulated another video, shot in a similar, glossy documentary style — and then, after questions from STAT, deleted it and re-posted it in edited form. The video follows a Michigan patient, Ron Diehl, who has Ewing sarcoma, a rare form of cancer associated with the bone. He was running out of options when, nearly a decade ago, he tried the drug ganitumab as part of a clinical trial. He’s been getting monthly infusions ever since. Surrounded by his beaming children, Diehl says he’s gotten his life back thanks to the drug. What the video doesn’t mention: The drug in question came out of the labs of Amgen, a separate and far bigger biopharma company. NantWorks, the umbrella organization over Soon-Shiong’s web of companies, licensed the drug from Amgen in 2015 — after Amgen gave up on it because it had failed in a late-stage trial against metastatic pancreatic cancer. 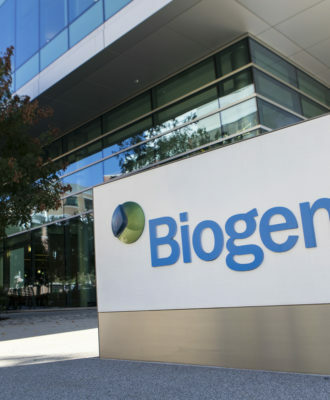 Amgen halted that trial before it was completed, after concluding that the drug was not helping patients. 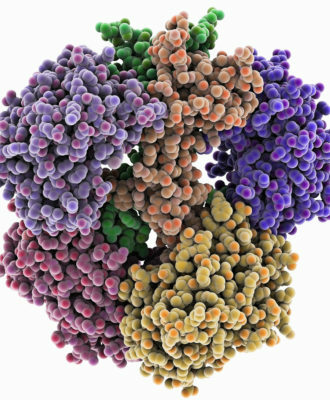 The drug, a monoclonal antibody, could still be shown to work against other types of cancer, of course, or perhaps it might work in combination with other therapies. That’s why Soon-Shiong’s team licensed it. One of his companies, NantCell, is collaborating with Novartis on a 47-patient clinical trial testing ganitumab in combination with a small molecule. 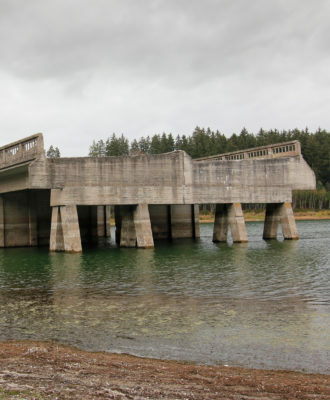 That trial is expected to wrap up this summer. Plans are also in the works for a late-stage study, to be sponsored by the National Cancer Institute, testing the drug in patients newly diagnosed with Ewing sarcoma whose disease has spread to other parts of their body. The edited version fails to mention that the drug is still experimental, and has not been approved by the FDA. The two videos were released as NantHealth went on a PR offensive following the STAT investigative reports. On March 16, Soon-Shiong and NantHealth put out a press release accusing STAT of “false and misleading” coverage of his business, research, and philanthropic ventures. The two lengthy open letters that accompany the press release repeatedly misrepresent the content of the two STAT articles. Managing Editor Stephanie Simon responded in detail in a letter to the company. STAT stands by its stories. In the days since, Soon-Shiong and NantHealth have been busy on social media. There have been cures for cancer for decades. However, the pharmaceutical money lust, has been stopping it. I would type out the known cures, but what for, it will just be a tip to the pharmaceutical police force. I worked as an Intensive Care Critical Care physician for years. I got into cancer, My mind is such that I sought cures and found them, for 5 years I worked in integrative cancer therapy, and did a number of studies. One study took 384 patients with stage 4 cancers and in 8 weeks 80% WERE IN complete remission. Cancer is a systemic illness. It does not go away. out spoken women can be a problem, especially when they are correct. Are your company, doing anything curing dementia people___________________? Thank you.